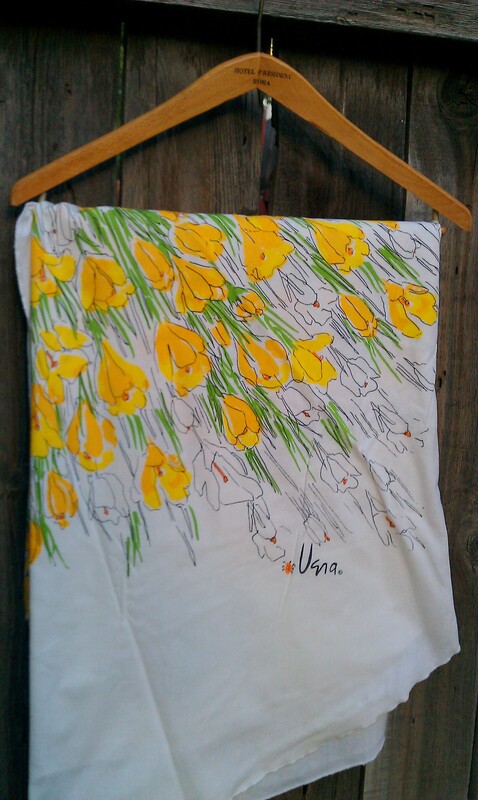 Vintage Vera Tulip tablecloth and napkins featured in TWO treasuries! AMAZING Vintage Vera Neumann Tablecloth AND 4 Napkins. This beatful and RARE set has lovely Tulips design. 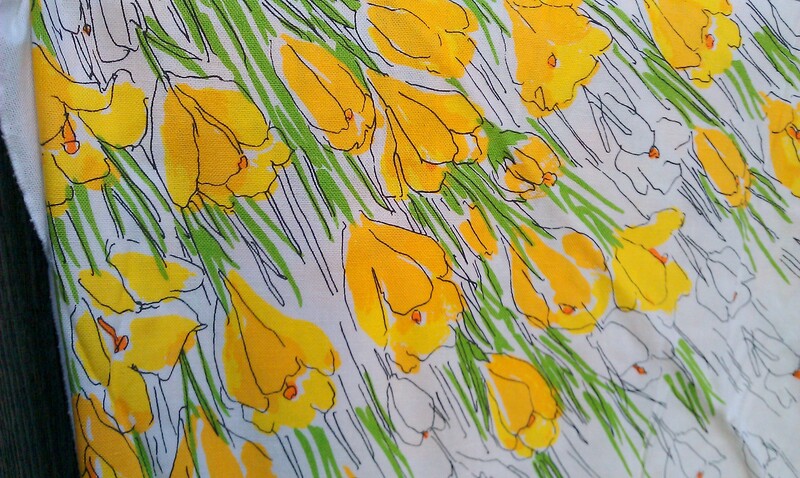 Very bright yellow springtime flowers in cotton fabric. This set is Authentic and signed by Vera. The tablecloth is an oblong oval shape. The napkins are square. VERY VERY pretty! Wonderful condition, no fabric wear or tears. NO fading! There are some stains, very small. Mostly they look like discoloration of the white in some areas, blends into the bright yellow flowers well.. One stain shown on a napkins. Personally I couldn’t see many terribly obvious discolorations without really looking, just wanted full disclosure. Would make a sunny kitchen complete! JessFindsVintage Featured in an AMAZING treasury. AMAZING Vintage Vera Neumann Tablecloth AND Napkins. This beatful and RARE set has lovely Tulips design. 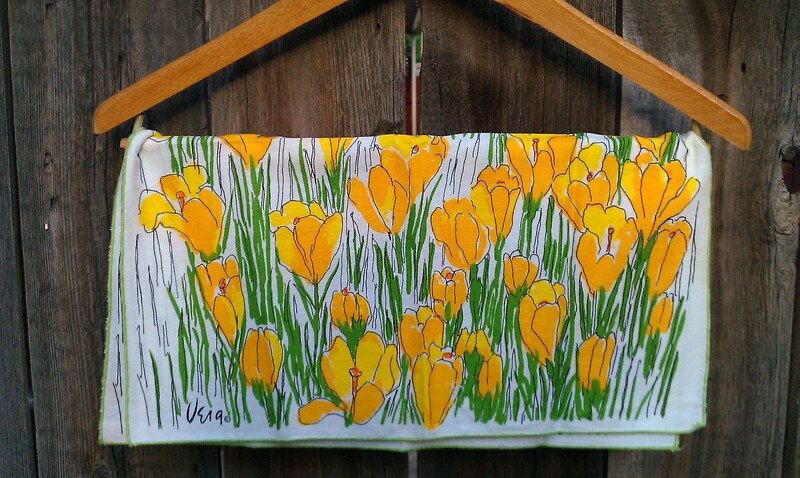 Very bright yellow springtime flowers in cotton fabric. This set is Authentic and signed by Vera. The tablecloth is an oblong oval shape. The napkins are square. VERY VERY pretty! Wonderful condition, no fabric wear or tears. NO fading! There are some stains, very small. Mostly they look like discoloration of the white in some areas, blends into the bright yellow flowers well.. One stain shown on a napkins. Personally I couldn’t see many terribly obvious discolorations without really looking, just wanted full disclosure. Would make a sunny kitchen complete! Spring Blossoms treasury brought to you by: TreasuresFromMaine from TreasuresFromMaine :Here in Maine these flowers bring joy after the long winter. Comments Off on JessFindsVintage Featured in an AMAZING treasury. Soon it will be Spring.